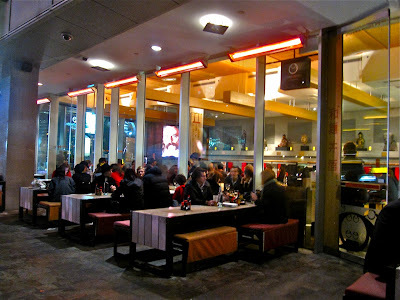 Address: Federation Square, Corner Swanston and Flinders Streets, Melbourne. 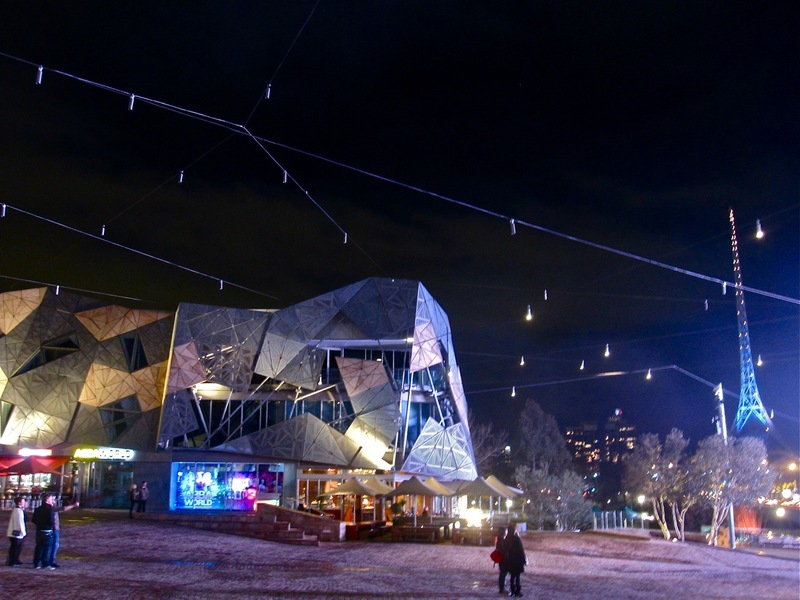 Overlooking Federation Square in all its illuminated night-time glory, Chocolate Buddha is a familiar favourite to many. Being extremely popular, the restaurant now takes bookings. This is a must if you plan to go for dinner. 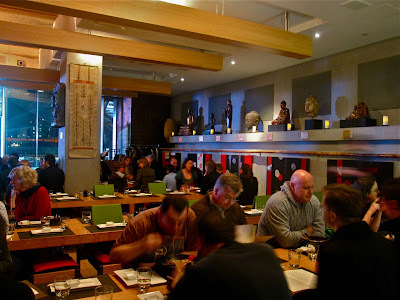 The first thing you notice as you enter the 160-person communal dining space (be prepared to sit opposite your date and in between two other couples) is the row of copper coloured Buddhas and other ornaments that garnish the far wall. If you have an extra good eye, you might spot the favourite: a dark brown figure with an especially likeable face from whom the restaurant borrows its name. 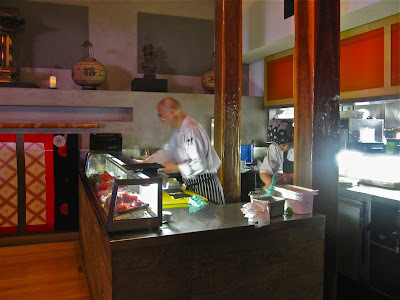 Also worthy of attention are the sushi chefs slicing and dicing to the right of the door as you enter, as well as TV screen displaying slideshows of rice fields. If you forget to book you can wait at the bar for one of the long tables, the stools facing the window along a bench, or one of the outdoor tables that overlook the screen in Federation Square. Waiting is far from tedious: the extensive drinks menu ranges from imported beers to traditional sake, and includes a selection of Japanese inspired cocktails. We were immediately accommodated on one of the outside tables. Even in the middle of winter, the heating was warm enough for us to remove our jackets. The high quality Japanese food is the result of local and specially sourced ingredients, served fresh every time. 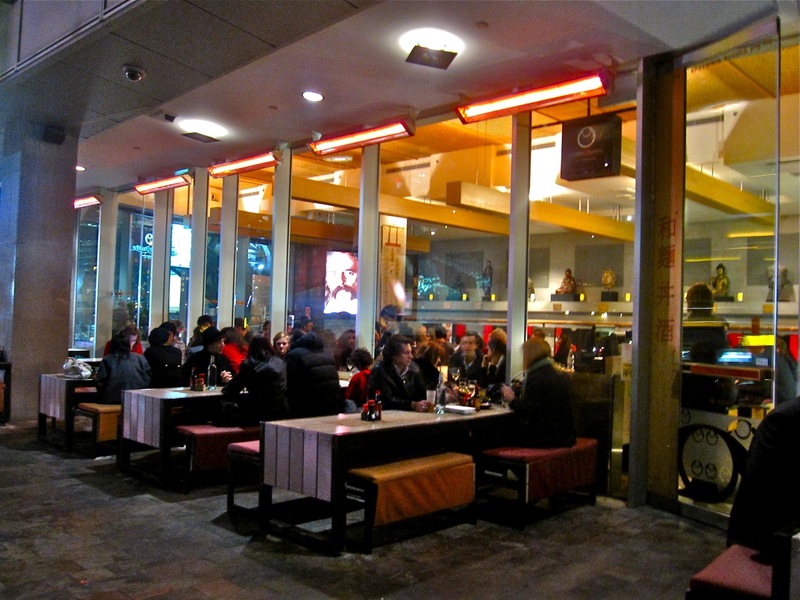 Diners are encouraged to eat their meals as soon as they are brought out and the entire dining experience is obviously modelled on traditional Japanese dining rooms. 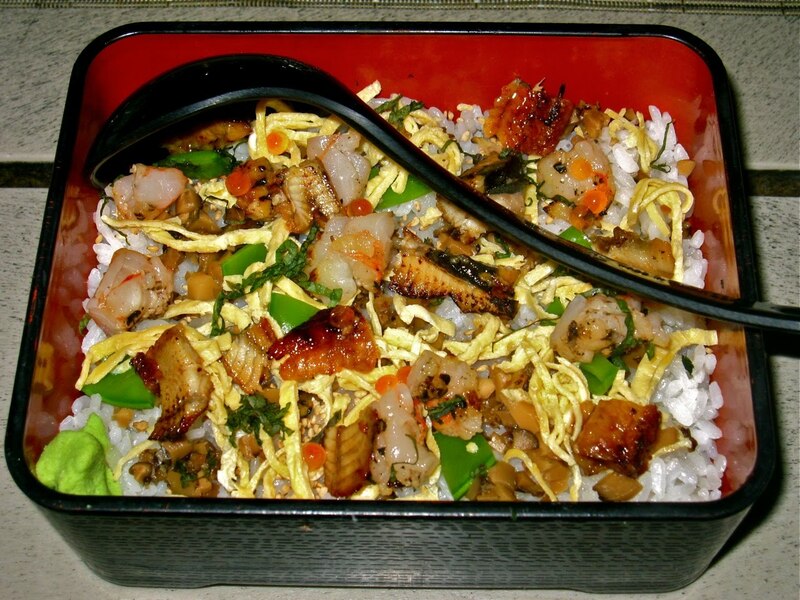 Ramen (noodle soup) and Donburi (rice dish with toppings) are the staple menu items, while the sushi and sashimi are irresistible and the smaller Zensai dishes are made to share. To begin we had two Zensai dishes. We ordered traditional edamame soybeans, which popped into our mouths leaving a crunchy trail of salt. 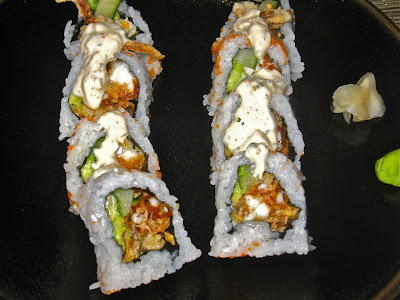 Next, we couldn’t resist the soft-shell crab sushi, mainly due to an infamous familial weakness for this particular shellfish following a trip to Vietnam. The 8 piece inside-out roll came with avocado and cucumber and was topped with fish roe and finished with homemade tartare dipping sauce. It was everything we expected. 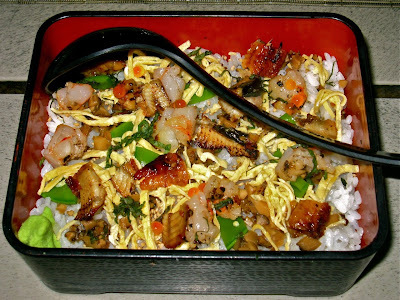 Keen to try something a little bit different, my friend ordered Gomoku-Don, which consisted of sushi rice topped with grilled unagi (eel), prawns, snowpeas, shitaki mushrooms, shiso, omelette, salmon roe and sesame, all served in a chirashi box. It was a smaller dish intended for a starter, but with the addition of Zensai it was enough for one person. 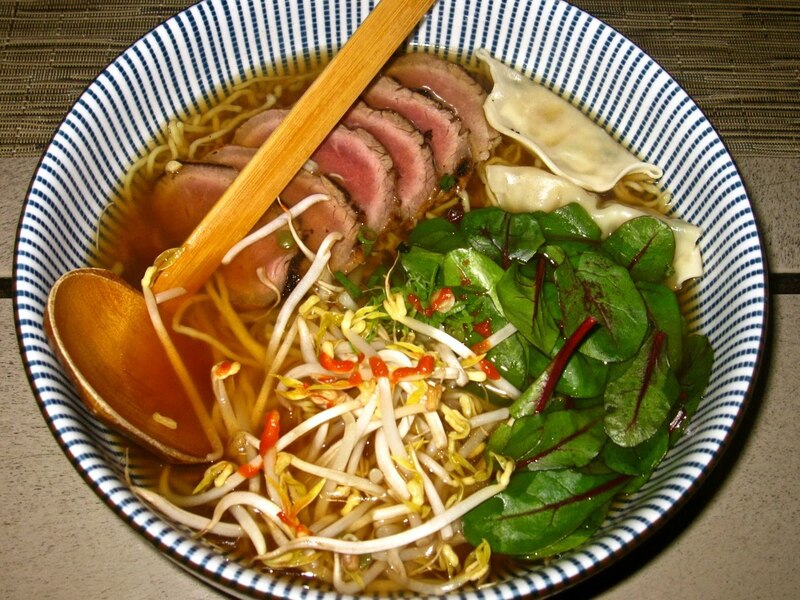 Also ordered for mains were the Gyu Ramen, a soup-noodle dish with chilli marinated beef, vegetable dumplings, swiss chard, and bean sprouts. Usually what I order when I visit, I can definitely vouch for this assortment of tastes as a fail-proof meal. I also had a Ramen dish, Chuka Miso. 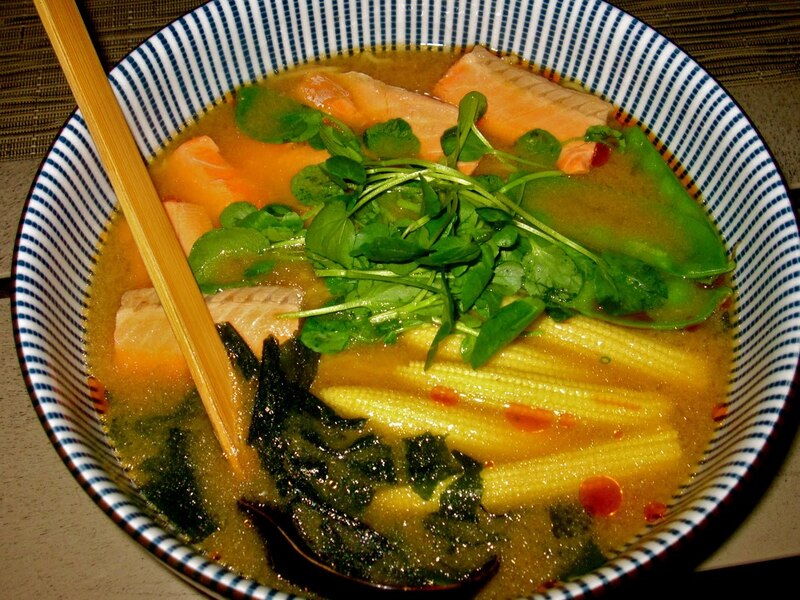 It comes with poached fish of the day (which happened to be salmon), snow peas, baby corn, seaweed, and spring onion, and is topped with crunchy watercress and a dash of chilli oil. 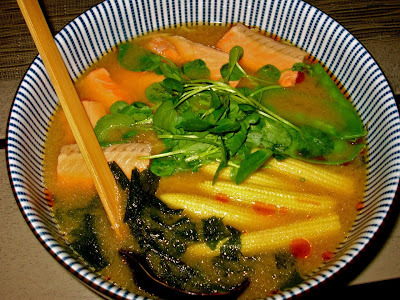 The broth was nothing less than addictive, combining the flavours of the individual ingredients into a mouth-watering, Japanese potion. The rest of the table ordered Donburi, dishes number 304, 305 and 306 to be exact. Dish 304, Teriyaki Gyu Don, consists of sirloin steak grilled to perfection, served with onions, swiss chard and pickles over rice. 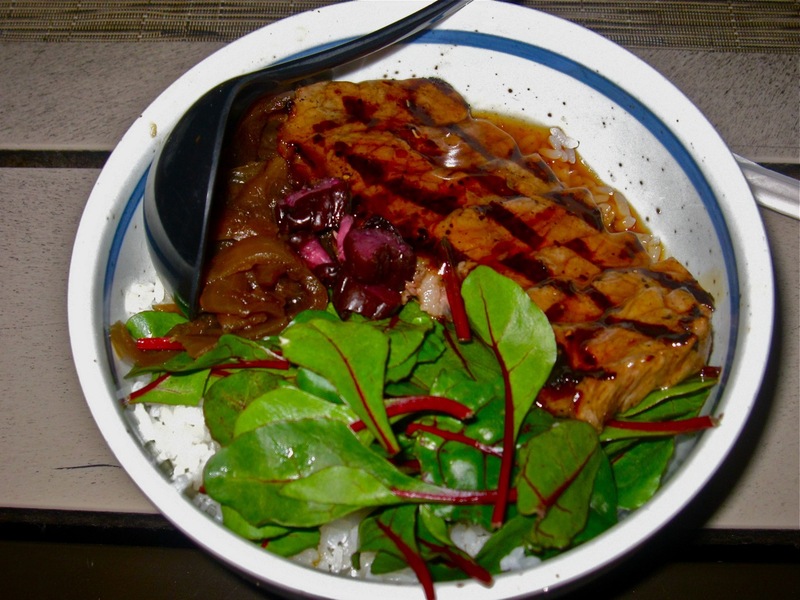 It is the perfect meal for those less used to Japanese food or for meat lovers, without excluding gourmets by any means. 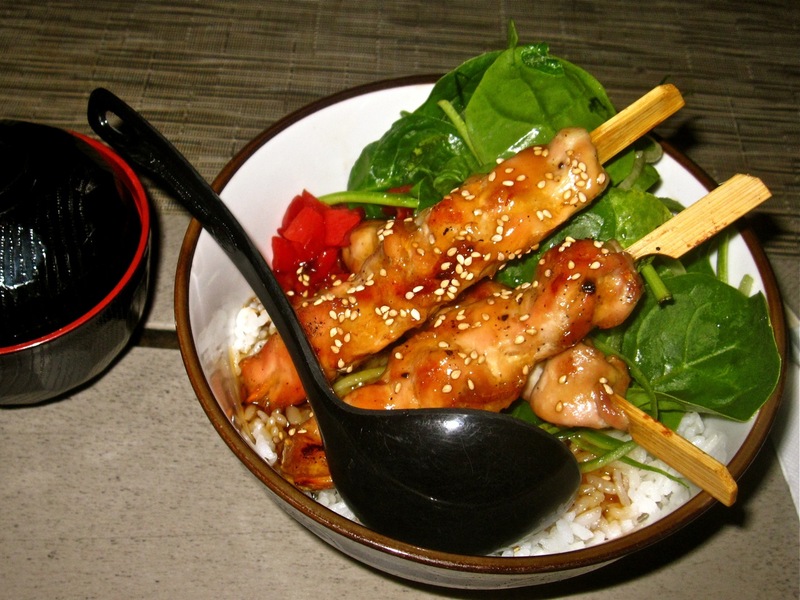 Dish 305 included three free-range chicken Yakatori skewers, glazed with teriyaki and served on a bed of rice with a fresh cucumber and spinach salad. Succulent and with an easy-to-please quality, this meal is a good option for younger, ‘fussy’ eaters – but be warned, parents may become jealous of the meal choice. Shake Oyaku Don is dish number 306. 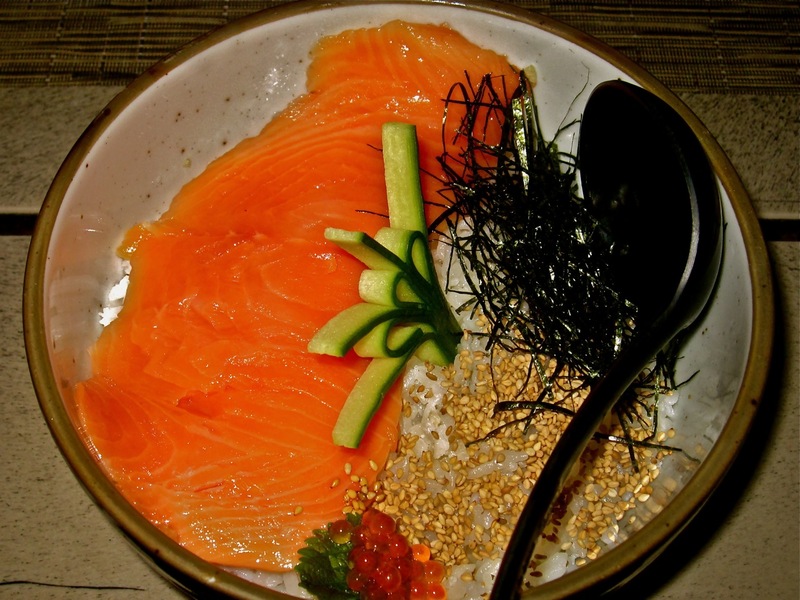 Fresh cured, cold salmon is served on sushi rice with nori, sesame seeds, shiso leaf and salmon roe. 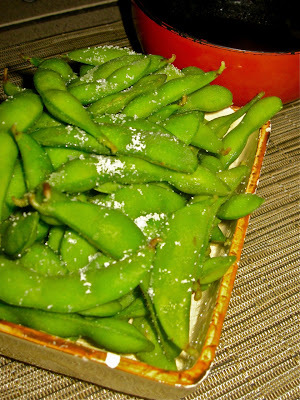 Also a past-time favourite of mine, it seems as though with every visit the toppings become less generous in this dish. 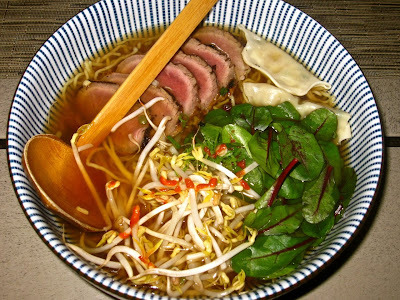 Although tasty, I recommend sticking to the Ramen or heartier dishes in order to be fully satisfied. Although dessert wasn’t ordered, I was sad to leave without trying the green tea ice cream or the tempura banana, not to mention the departures from sweet Japan: classic chocolate mousse and sticky date pudding! 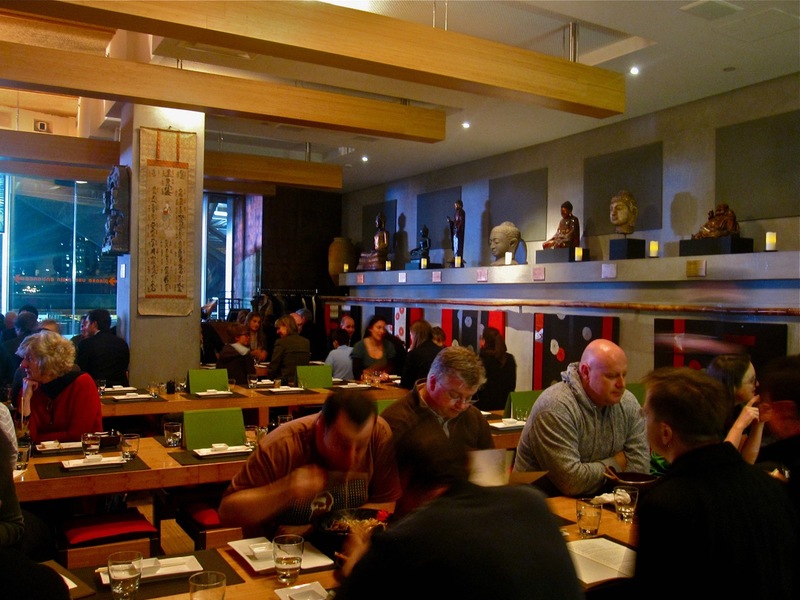 If you order well, Chocolate Buddha can easily get a four-out-of-five-star-rating. That being said, it has taken me quite a few visits to get it right. 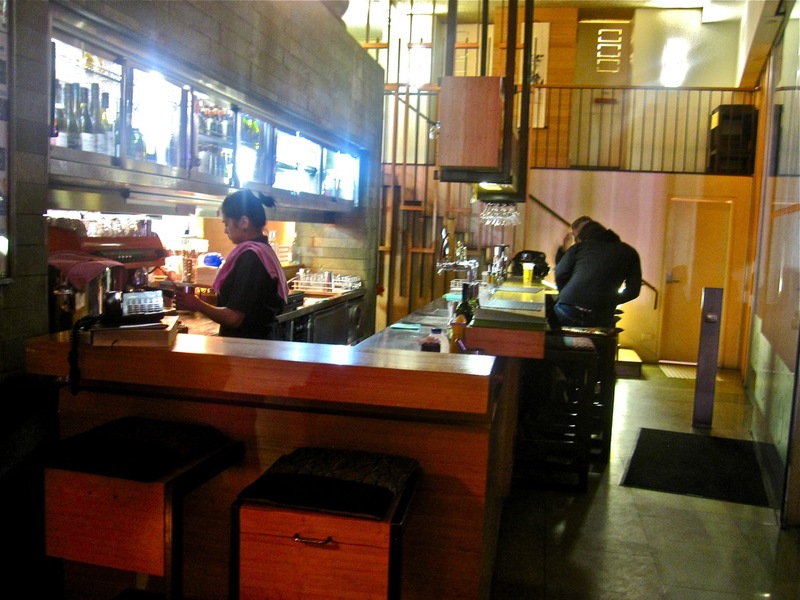 The staff are friendly and helpful and often make very good recommendations if you are stuck on the overwhelmingly delicious menu.